The book of Revelation begins with John, on the island of Patmos, receiving a vision from God. He was told to write it down and send it to seven churches: Ephesus, Smyrna, Pergamum, Thyatira, Sardis, Philadelphia, and Laodicea. 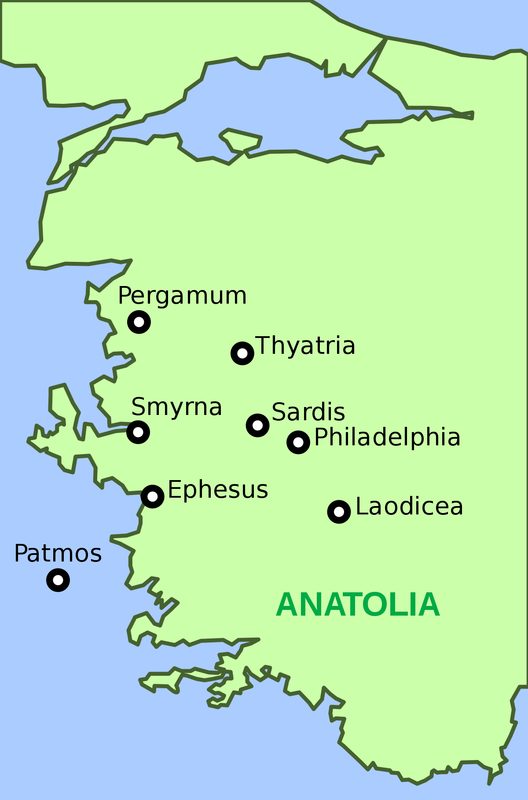 Below is a basic map from Wikipedia showing the geographical location of the churches. When researching Revelation, be careful about your sources. Reading Wikipedia’s description of the seven churches, I saw it covered quite a few views on Revelation, but didn’t have great transitions from one view to the next. They were all kind of blurred together. I used their map image because it’s tough to find a map on the seven churches without a link to a weird website or too much prophetic detail. In John’s vision, each church receives an affirmation, reprove, and reward. Only one church does not receive a warning for any sinful actions. Studies on the culture and economic statuses of these cities have been done and the information found matches what is said of the churches in John’s letter. For the church of Sardis, their message starts off with a reprimand. The reputation they created for themselves does not match what’s inside their hearts. God can see through their actions and calls them incomplete. However, not all of the Christians at Sardis had fallen into that dead state. God acknowledges them and affirms their endurance in the faith. Their reward for perseverance? They will be clothed in white garments and have a guaranteed spot in the kingdom of God. Jesus will stand up for them before God the Father. Looking ahead, check out Revelation 4:4. Do you see anything familiar? What are the twenty-four elders wearing? We’ll pick up more of this in a discussion on the rapture. This has been a brief look into the seven churches. If going into more history of the churches interests you, Kay Arthur has a great, inductive Bible study on Revelation. She spends some time studying the seven churches and shows you how to take a closer look into prophecy. If you have any questions, feel free to message me at writemegbutler@gmail.com!